Kingdesk Color System provides in a fan deck format a selection of 1008 very fresh and clear shades for both interior and exterior paint, with an average colorants consumption of 1.9%. Each dark color shade is toned down mathematically for easy reference in 5 cut downs. A ready to go formula book under tinting when using CHROMAPRO , CHROMAPLUS and AQUAFORTE colorants is supplied to our colorants users. 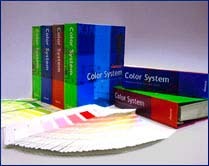 In addition we supply a comprehensive color guide for color selection and the color shade you can expect at different strength with a simple coding system indicating the strength of the color. An elelctronic color library is included in the newly developed automatic dispenser TOP FLOW by Coloriance. The color system is also available in fan decks of 720 shades, 320 shades or the complete ring binder version to meet individual demands. Personalized customised color system are welcome on project basis when using our colorants.